The biggest health story of the year has received almost no notice. We are healthier and living longer than in the entire history of our country. Why is such great news not being shouted from the rooftops? The media incessantly tells us we that our diets, weights and modern lifestyles are so deplorably unhealthy that massive new public health programs are urgently needed and that a complete transformation of our society to coerce us all into healthy lifestyles is imperative. But every year the evidence provides no support for such doomsday claims or the need for such vast, government interventions. The latest vital statistics data from the CDC National Center for Health Statistics was just released, based on statistics reflecting 99% of the demographic file and 96% of medical records for all deaths in the United States in 2006. This data is compiled each year to provide evidence to help ensure public health resources are prioritized and appropriately spent to best improve the population’s health. 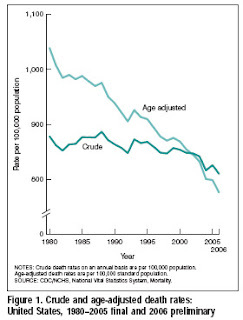 Age-adjusted death rates decreased significantly between 2005 and 2006 for 11 of the 15 leading causes of death: Diseases of heart, Malignant neoplasms, Cerebrovascular diseases, Chronic lower respiratory diseases, Accidents (unintentional injuries), Diabetes mellitus, Influenza and pneumonia, Septicemia, Intentional self-harm (suicide), Chronic liver disease and cirrhosis, and Essential hypertension and hypertensive renal disease. Age-adjusted death rates for Alzheimer’s disease, Nephritis, nephrotic syndrome and nephrosis, Parkinson’s disease, and Assault (homicide) did not change significantly between 2005 and 2006. Just between 2006 and 2005, deaths due to heart disease dropped 5.5%, diabetes is down 5.3%, cancers are 1.6% lower, strokes down 6.4%, influenza and pneumonia down 12.8%, chronic lower respiratory diseases down 6.5%, hypertension down 5%, chronic liver disease and cirrhosis down 3.3%, suicide down 2.8%, septicemia or blood poisoning down 2.7%, and accidents are down 1.55%. Infant mortality dropped 2.3% and, with the exception of one year, infant mortality has dropped every year since 1958. Discrepancies among various demographic, ethnic and immigrant populations continue, but are narrowing. Despite the popular yarn, we are not dying in record numbers from unhealthy lifestyles and modern life is not killing us. There simply is no good evidence. 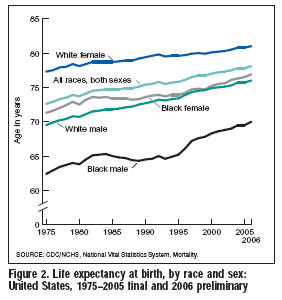 Life expectancy also hit another record high, according to the new CDC statistics. Despite those continuing to repeat that doomsday prediction that “today’s children are destined to be the first generation to have shorter lifespans than their parents — unless drastic action is taken to slim them down” — the facts show the opposite. Every year, in fact, the government’s actual health data has continued to show that our children are living longer and healthier lives than ever before. There’s not even a hint to indicate that that could change. Babies born in 2006 can expect to live to 75.4 years for boys and 80.7 years for girls. There's been a fairly steady increase for more than a century. By comparison, babyboomers born in 1950 had a life expectancy of 65.5 and 71 years, respectively. And our grandparents born in 1900 had a life expectancy of a mere 48 and 51 years, respectively. 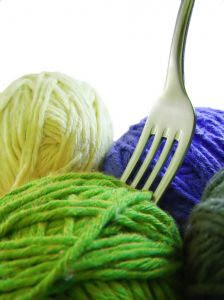 Despite the popular yarn, children today are not sicker or expected to live shorter lifespans than their parents.